Misc data about the avatar This class holds replies from third party databases. There's no fixed format, and interpretation is left to the end user. Definition at line 329 of file llfloateravatarlist.h. Definition at line 333 of file llfloateravatarlist.h. Definition at line 338 of file llfloateravatarlist.h. Definition at line 331 of file llfloateravatarlist.h. 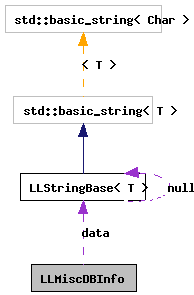 Referenced by LLFloaterAvatarList::handleIM(), and LLMiscDBInfo().